The Phillies first rounder from this past draft is hitting well in Lakewood. The baseball stage is clearing for the major league playoff push, as Phillies affiliates in Reading and Williamsport finish their regular seasons on Labor Day Monday. The other two major teams in Lehigh Valley and Clearwater are preparing for playoff appearances. While the Phillies hope to overcome recent lackluster play and join them as postseason contenders, lets rake one last look at who's hot, who's not and who's injured down on the farm"
Philly's first round pick a few months ago is finding his hitting stroke, raising a putrid .188 batting average by more than 30 points over the last two weeks. He was on the disabled list earlier this summer but it no longer shows. In 39 professional minor league games the 22-year-old from Wichita State is hitting .248. 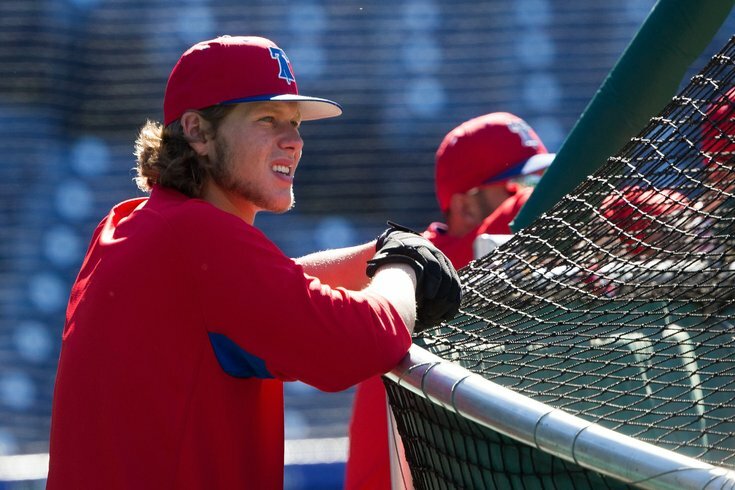 The 2017 first rounder is turning out to be a prospect Phillies fans can truly get excited about. Just 22 and already in Double-A, he is hitting .316 this season with six homers since being called up. He hasn't played since August 24 for unknown reasons (he is listed on the temporarily inactive list). The former No. 1 overall pick is hitting like a top prospect should, at a .310 clip over his last 10 games. He had a four-hit game back on Friday and has tallied 117 hits over 114 games in Single-A. He could climb to the high minors when next spring arrives. Suarez started one game in the majors but still qualifies as a top 10 prospect according to MLB.com. Back in the minors, he's pitched well as his ERA has lowered to 2.81 for the year. Once the Iron Pigs playoff run ends he will likely be added to the Phils 40-man roster. Irvin is red hot and a player Phillies fans should be talking about. In his last four starts, he is 4-0 and has allowed a single run (over 30.1 innings). He could add some needed reinforcements if he's called up sometime during September. Medina is the Phils' No. 3 prospect and has an impressive 10-4 record this season — but with a 4.12 ERA over 24 starts. He is just 21 and has the stuff to be a valuable member of the Phillies pitching staff if he continues to progress. The team's No. 7 prospect, while just 19, has struggled against minor league pitching of late, hitting just .222 over his last 10 games. He has shown a power stroke this season, however, slugging 13 home runs, 18 doubles and two triples. In a "what have you done for me lately" kind of league, De Los Santos finally hit a snag allowing four runs in just 4.2 innings last week. Like Suarez, De Los Santos also made a spot start in the big leagues and is likely to return once the Iron Pigs season concludes. Sanchez is listed as the top Phils prospect everywhere you look, but he hasn't thrown a pitch since June. His final 2018 numbers were 4-3 with a 2.51 ERA. He has had a strained quad for a while. A second member of the Phillies top five prospect list, Romero, is also on the DL where he's resided since July 20. Were he healthy, he'd no doubt have landed on our "hot" list, as he's gone 6-2 with a 2.53 ERA over his last 10 starts.